The first of a volley of cruise missiles is launched from the USS Bunker Hill in the Persian Gulf. 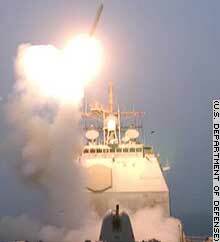 USS Donald Cook launches Tomahawk missiles toward Baghdad from its position in the Red Sea. Anti-aircraft fire lights up the skies of Baghdad. BAGHDAD, Iraq (CNN ) -- The U.S.-led attack on Iraq has begun with a volley of cruise missiles that officials say was intended as a "decapitation strike" to take out Iraqi leader Saddam Hussein. Hours later, Iraqi state TV broadcast a defiant address from the Iraqi leader describing the U.S.-led military campaign against Iraq as "criminal acts," saying his countrymen would be victorious and its enemies humiliated. Saddam gave Thursday's date, March 20, as a sign that his address was recorded after the first attack, although there was no indication as to whether it was taped before or after the cruise missile strike. Information Minister Mohammed Saeed al-Sahaf said that one civilian was killed and several more were wounded. Calling the U.S. and Britain, the "international gang of low-lifes," he vowed to turn Iraq into "hell'' for invading American and British forces. Iraq's information ministry had earlier said 10 Iraqis were killed in the attack but did not specify whether they were military or civilian casualties. However, sources have told CNN that a large-scale U.S.-led military operation may still be several hours away. In his address from the White House, Bush said every effort would be made to safeguard innocent life although the U.S. would use the full force of its military might. The campaign would be "broad and concerted" he said, and the U.S. would "accept no outcome but victory." He said the military operation would disarm Iraq, free its people and "defend the world from grave danger." The first strikes came less than two hours after Bush's deadline expired for Saddam to quit Iraq or face a U.S.-led attack. At around 5:30 a.m. Thursday (0230 GMT), air raid sirens blared throughout the Iraqi capital and were followed by loud bursts of anti-aircraft gunfire and several explosions. White House sources said the decision to strike came after a nearly four-hour meeting in the Oval Office in which CIA Director George Tenet and Pentagon officials told Bush they could lose the "target of opportunity" if they didn't act quickly; Bush then gave the green light. An explosion is seen in Baghdad early Thursday.